TT: Bathroom? Rest Room? Toilet? JANE: Well, Alan, last time you promised the secrets of British “toilet humour.” With some (very American) trepidation, I shall invite you to begin. JANE: My dad would have loved that. One of his often repeated jokes was that he was from the state of “Illinois” in which the “s” was silent, like the “p” in swimming. I remember when I figured that one out. I was torn between fascination and horror. But I stray from our fascinating linguistic discussion. Pray, continue. Passers by with slow reflexes would have a moist and fragrant day. Colleagues would keep their distance. And this, too, is hilarious, slapstick humour at its best. JANE: This also reminds me of my dad… One of the most common American euphemisms for toilet is “john.” Guess what my dad’s first name was? Guess what euphemism for “toilet” we emphatically did not use in our household? And that makes me wonder… Do girls named “Louise” or boys named “Louie” every get called “Lou”? Do they come in for teasing? ALAN: Probably not. I’ve never met a boy called Louie so I can’t comment about that. However I do know several girls called Louise. And they are invariably called Louise. We tend not to abbreviate names in the same way that you do – there are some exceptions of course; “Bill” instead of “William”, for example. But by and large, names are rarely abbreviated. I’ve met several Americans who insist on calling me “Al” which absolutely infuriates me because I think of myself as Alan. I simply can’t identify with this stranger called Al. Perhaps this view that things (and people) are what they are rather than being something else (as would be implied by using an abbreviation or a euphemism) might be a contributing factor in our basic openness about things like bodies and bodily functions both in real life and in fiction. Call a spade a spade, as the proverb has it. Television is perhaps a good example. In the 1960s the BBC was broadcasting a dramatization of the life of Casanova. Colour television was just starting to become available, and my father immediately went out and bought a set because he wanted to see the naked ladies in colour rather than in black and white. Everybody thought this was a perfectly reasonable thing for him to do; it raised no eyebrows at all. But even today, totally naked ladies seldom if ever seem to show up on American prime time television. In the 1960s it would have been utterly unthinkable. However, that is starting to get into cultural rather than linguistic differences and we are wandering off topic. JANE: I rarely watch television, so I can’t answer to how many naked ladies are telecast in this enlightened Twenty-First century. Do the British still call the toilet the W.C. or has that fallen out of date? Any other euphemisms we Americans should learn to ease our visits to that green and pleasant land? 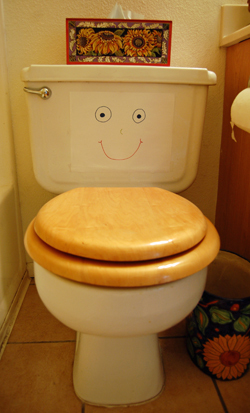 ALAN: W.C. (or Water Closet) is perhaps a bit old fashioned these days. If you used it you would certainly be understood, but you’d be regarded as rather quaint. In the nineteenth century navy, the phrase “the head” was used. Also “the seat of ease” (lovely phrase!). The latter has vanished from the language, but the former is still in use in the navy and is sometimes used by civilians for pretentious effect in casual conversation. But really “Loo” is probably as close as we come to a euphemism. Nevertheless the potential for comedy is large. I once saw a stage play in which an Australian excused himself by declaring that he was going off to “…point Percy at the porcelain.” This got an enormous laugh from the audience, of course. Robin, who is Australian, assures me that this is not a genuine expression (even though Australians are noted for their colourful use of language) so I presume the scriptwriters made it up just for the sake of the joke. However, if you go to a Spanish restaurant, you may find the restroom labeled “Hombre” and “Mujer”. In a German restaurant, you might be directed to rooms for “Mensch” or “Frau”. In many of these places, there is a little drawing, often with appropriate ethic costuming, just in case you can’t figure out the words. Not to be left out, theme restaurants put in their own variations. A place with a Western theme might have signs for “Cowboys” and “Cowgirls.” I heard a story about restroom signs at a dog show that were labeled “Pointers” and “Setters.” So maybe we Americans aren’t as deficient in toilet humor as you imagine. Anyhow, I’ve often thought future anthropologists might draw the conclusion that these places only served one sub-section of the population, rather than being open to the general public. This entry was posted on June 16, 2011 at 1:00 am and is filed under Thursday Tangents. You can follow any responses to this entry through the RSS 2.0 feed. You can leave a response, or trackback from your own site. Oh how the language has changed. In German, W.C. is the common usage (pronounced, roughly, “vay-tsay,” and standing for the English phrase “water closet”). German toilet humor tends to harp on one theme: whether or not men should stand to pee. Lots of restrooms (co-ed, obviously; I have no first-hand knowledge of men’s toilets) have signs saying something along the lines of “Kein pinkeln in stehen,” or “No peeing while standing.” This leads to a proliferation of comics and puns, such as one I saw where the man sat on the ground in front of the toilet and aimed up. It is a genuine point of contention and, as an American female, it was very strange to see so many little cartoons of naked men in the toilet stalls! Gosh yes — I’d forgotten about that phrase. You are right, it is an English euphemism used almost exclusively by women. It dates from the days (now long gone) when women’s public toilets had coin operated locks on them. The entry fee, of course, was a penny. Men’s public toilets have always been free (can you say gender discrimination?). Gender discrimination or just the reality that women are more dependant on facilities where men can always go water a tree?